With continued evidence piling up that shows red meat and processed meats – such as bacon and sausage – are not good for your health, it’s time to start choosing the white meat or vegetarian option. Burger or grilled chicken? Bologna sandwich or PB&J? 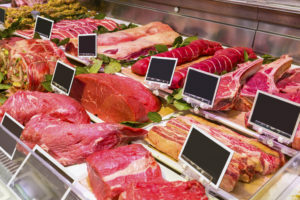 With continued evidence piling up that shows red meat and processed meats – such as bacon and sausage – are not good for your health, it’s time to start choosing the white meat or vegetarian option. And you shouldn’t just make this swap on occasion. Studies show that red and processed meats should be avoided as much as possible by both adults and children. 1. Potentially cancer-causing. A recent report by the World Health Organization categorized processed meats as level 1 carcinogens, placing them in the same category as cigarettes and alcohol. The organization categorized red meat as a level 2a – probable carcinogen. This report looked at the rates of colon cancer and found that eating the equivalent of two slices of bacon per day increases the absolute risk of developing colon cancer by 1 percent. On the other hand, a diet rich in fiber, fruits and vegetables has been associated with a reduction in risk for the development of colon cancer. 2. Cardiovascular health. Data has shown time and time again that red meat is linked with high cholesterol, and in turn, increases risk for cardiovascular disease such as heart attacks and strokes. Consumption of less meat also is associated with decreased rates of obesity in both children and adults. 3. High cost. Meats cost significantly more than vegetarian proteins such as beans, nuts and tofu. Replacing one omnivore meal with a vegetarian meal can save more than $1 per person. 4. The environment. Raising cattle significantly impacts the environment. More than 30 percent of grains grown in the world are fed to cattle. Cattle themselves produce significant amounts of greenhouse gases. Cutting back on meat consumption is not only healthy for you, but it’s also healthy for the environment. Reducing meat consumption will help keep our planet healthy for our children. 1. Embrace Meatless Monday. If you currently eat meat daily, choose one day per week to cook a vegetarian meal. There is a national movement to eat vegetarian on Mondays (#MeatlessMonday), but if another day works for your family – choose that day instead! 2. Try vegetarian tapas. Many people find planning a vegetarian meal intimidating if they’re accustomed to eating a dinner with a main dish of meat. To ease into a vegetarian meal, try making three to four side dishes, and serve them family-style. You can let each member of the family pick a dish to try to turn it into a meal. 3. Start cooking with seafood. Cook fish or other seafood one night per week. Use either fresh, frozen or canned, and add it to your weekly menu rotation. 4. Swap red for white. When cooking your favorite recipes that call for ground meat, reach for ground turkey or chicken. These white-meat options work great in dishes such as tacos and chili. 5. Put veggies on display. Don’t try to replace red meat with an imitation meat product like veggie dogs. Instead, embrace the vegetables for what they are. Focus on choosing recipes that highlight vegetables, rather than hiding them. As always, try to include your children in your food choices, and get them to help with food prep. Children not only love helping out with meals, but they also enjoy having a say in what they eat. Ask your child to help prepare the vegetables – whether it’s chopping or peeling or adding them to the pot. Allow your kids to accompany you to the grocery store or farmers market, and let them each pick out a vegetable to try. Then incorporate their pick into your next vegetarian meal. Going vegetarian (even if just for a few days a week) can be a fun transition for the whole family.